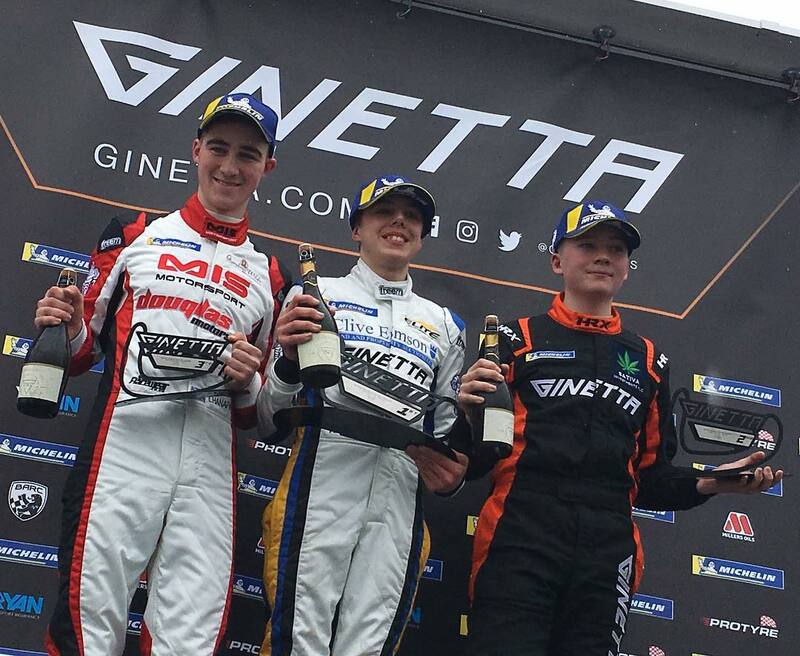 It was a successful opening weekend for Douglas Motorsport in the 2019 Ginetta Junior Championship. Zak O’Sullivan, who only arrived at the team a few days previously, topped the Free Practice times in advance of his first ever car race. Qualifying saw Lorcan Hanafin take P2 for race 1, with O’Sullivan in P3 and Gus Burton P5 -three Douglas cars in the top 5 grid positions. The qualifying positions for the second race were determined by drivers’ second quickest times which meant Zak O’Sullivan took Pole position, and Lorcan Hanafin completed an all Douglas Motorsport front row. Race 1 saw Hanafin, O’Sullivan, and Gus Burton involved in a 5 car race for P2. It was the rookie O’Sullivan that won out on this occasion and he put his car over the line in second, giving him his first podium in his very first car race and his first win in the Rookie class. Burton was fifth with Hanafin 9th. In race 2, although he started in pole position, O’Sullivan completed the race in 9th – enough to give him the lead in the 2019 Ginetta Junior Championship season. Lorcan Hanafin finished in 3rd.